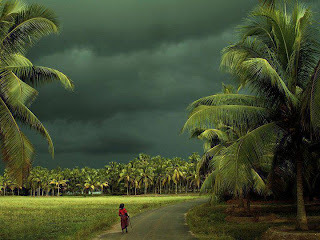 Kerala, God’s own country also known as “the land of coconut”. 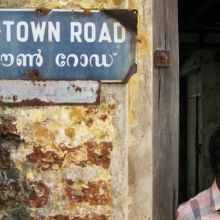 Even though scholars says the etymology of this word is related to the Chera kingdom, Cheralam later vocalized as Keralam. The beauty of Kerala says it is really the land of coconut. I am rephrasing a proverb, unknown is an ocean and known is a drop, and we’ll discuss about those known drops…. 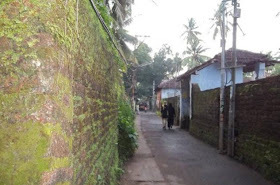 It is said that Western wall of the Pardesi synagogue was erected with mortar (A local plaster made of treated marine bivalve mollusc of the Mactridae family, known as “ithil” in Malayalam language is widely found in the vicinity. It is treated by a process known as “Neettil”, and a powder or paste form plaster known as Kummayam or Chunnamb is made. Then it is mixed with fine gravel and water) mixed with Tender coconut water instead of plain water. Western wall of Paradesi Synagogue. 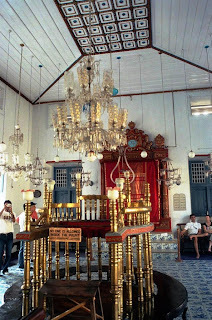 This first hand information is mentioned by Cochin Jews Abraham Barak Selam in his book - Cochin Jew Town Synagogue, 1929. 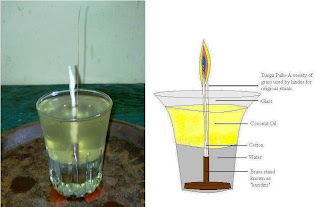 The reason behind using Tender coconut water as explained by Cochin Jews is that, it is one of the purest forms of water and it was used to keep the place holy. And Adv Prem Doss Swami Doss Yehudi, in his book The Shingly Hebrews, explains, Maharaja of Cochin, who took an active part in its constructions, ordered his labours to use coconut water to prepare the mortar. 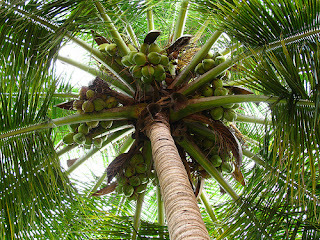 In India one of the most common offerings in a temple is a coconut. It is also offered on occasions like weddings, festivals, the use of a new vehicle, bridge, house etc. 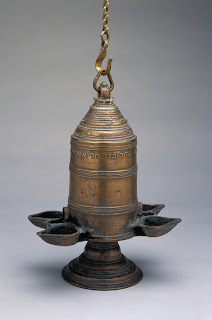 It is offered in the sacrificial fire whilst performing homa. The coconut is broken and placed before the Lord. It is later distributed as prasaada. The coconut is broken, symbolising the breaking of the ego. The juice within, representing the inner tendencies (vaasanas) is offered along with the white kernel - the mind, to the Lord. 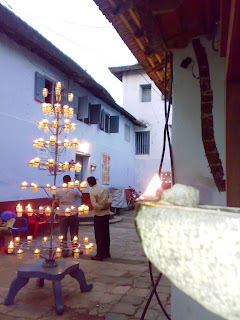 In the traditional abhishekha ritual done in all temples and many homes, several materials are poured over the deity among those tender coconut water is inevitable. And Tender coconut water is used in abhisheka rituals since it is believed to bestow spiritual growth on the seeker. Coconut water is a universal donor. 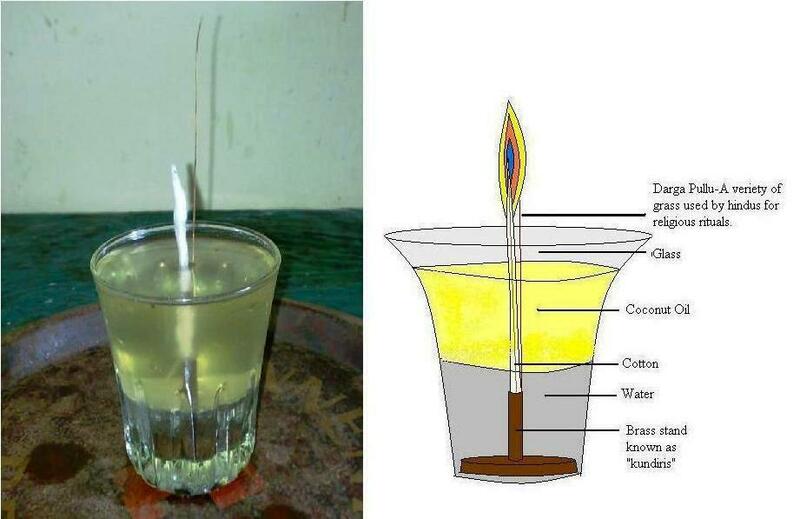 It is identical to human blood plasma. It can be used as an I.V. It is more nutritious than Whole Milk. Less fat and no Cholestrol. Coconut water is naturally sterile and as the water permeates though the filtering husk. If compared with a water purifier the water is filtered a 1000 times and gravity also plays a part in this process. So it is the most purest form of water or the 1000 times filtered water with adequate amount of nutrients. These may not be the exact reason why they had used Tender Coconut water for mixing the Mortar. But simply it was to keep the place most holy in any aspect, and another reason was the influence of Hindu traditions. 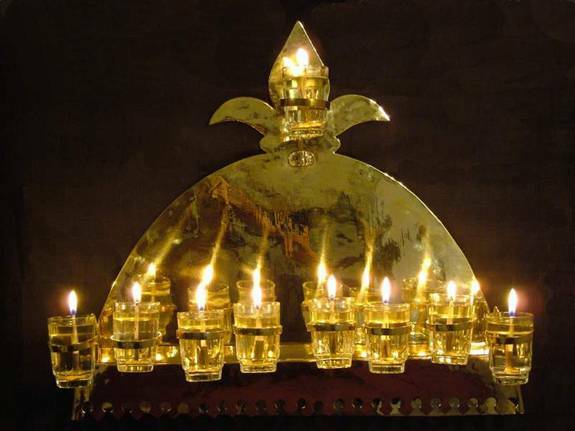 Along with this, other significance is that Coconut oil was used to light the Ner-tameed all synagogues of Kerala. On the eve of Friday to indicate the time of Sabbath the black granite receptacle stuck into all Jewish houses in Cochin, lighted in the evening using Coconut oil. 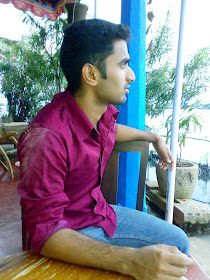 Still those can be found in Jew Town, Cochin. But now this tradition is replaced by lighting electric bulb. Aalvilakku (Lighted specially for Simhat Torah) on left and Kalvilakku (Black granite reptackle) on right. 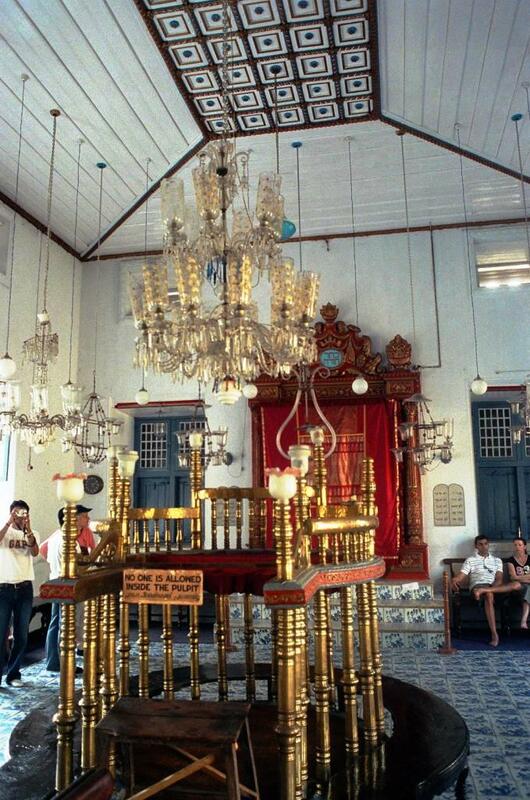 Yom kippur lamp, belongs to the Jews of Parur, Kerala. Yom kippur lamp, belongs to Jews of Cochin, Kerala. Even other festivals like Simhat torah, Yom Kippur and Hanukkah the lamps used were lighted by coconut oil later some were replaced by candles. 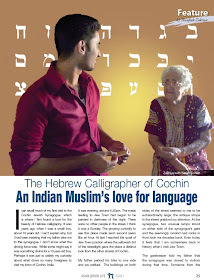 Culinary influence of the Coconut is also very much visible in Cochin jewish cuisine. 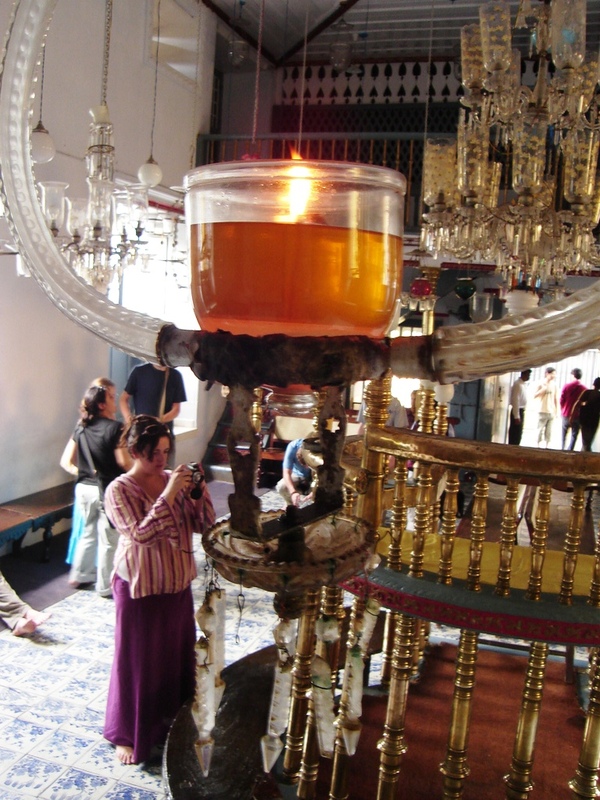 Most of the Cochin Jewish recipes call for coconut oil which was safe like olive oil in the matter of Kashurath. 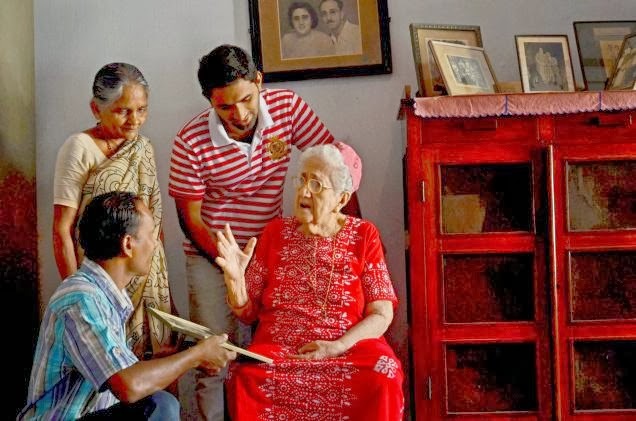 The other significant coconut product is coconut milk, which is an all time substitute for diary milk or milk product for Jews of Kerala, while cooking meat products. Example Kadathala (a thin rice batter crepe) is mixed with coconut milk while other crepe recipes call for diary milk, where the coconut milk enables them to fill meat products to make Kadathala pasthel. Kadathala Pasthel with meat fillings. 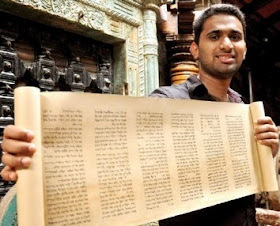 It is interesting to note that there is no mention of 'keralam' in ancient Sangam Literature, although Emperor Ashoka's edicts mention a south Indian dynasty named Kedalaputho in 261 BC. Roman historian Pliny called the western Indian coast Caelobothras in his Natural History and the fabled Periplus of the Erythraean Sea mentions Cerobothra ("Keralaputhra"). Jews who were dispersed in the Caribbean region also made extensive use of the coconut (Cuba, Jamaica, Barbados, Suriname etc.) I have a friend, who calls himself a 'Jewmaican', and he usea coconut in many dishes, including famous desserts like the Coconut Toto, which is great with ice-cream! An interesting post! 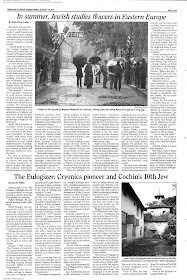 Cochin Jews who had arrived in the 1st Century would be expected to have assimilated coconut in their daily diet much more than has been described here. Or, are we discussing the adaptation of coconut by the later White Jews? As you suggest, more research is needed.A good beginning, indeed. thanks for additional details on the etymology of Kerala. It literally added colors to the topic and I even thinks that the theory mentioned about the Kera alam, is very much acceptable but the origin of the word Keralam is still a mystery as both Kera alam and Chera theory of origin is acceptable. And according to me both are parallely suiting with the etymological explanations. Interesting! 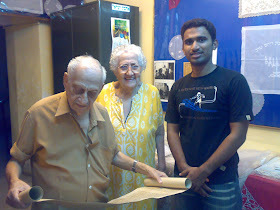 Since I haven't done any research on the Jews, I cannot contribute much- whatever I know is from what my Mom told me and interaction with the Jews from my generation--I loved their cuisine and upto today cook a lot of them. Like it is mentioned above, coconut milk is used for kadathala, Meen Mollie, Used in a kind of fish salad using Chala and koorka.. I haven't really eaten any chicken preparations with coconut milk--but perhaps they made it during festivals. I'm hoping to eat a lot of them again on my visit to Israel shortly and I'm also interested to see if they have adapted to the changed circumstances. research is just a medium to know about a topic but upto me each and every moment you spend with your mom is similar to that.... as it was a first hand info. Well even i have not found much meat recipe with coconut milk in it. but their observance of Kashurath as told by Sarah cohen if they are having meat based dish for breakfast they will avoid tea with milk, instead black tea is prefered. similarly they use to omit milk in that way so instead of using milk products they used coconut milk as for Kadathala pasthel. By the way, back to topic they use to omit milk with fish also but not sure about the Cochin jews settled in Israel.